This page presents a variety of calculations for lati­tude/longi­tude points, with the formulas and code fragments for implementing them. All these formulas are for calculations on the basis of a spherical earth (ignoring ellipsoidal effects) – which is accurate enough* for most purposes… [In fact, the earth is very slightly ellipsoidal; using a spherical model gives errors typically up to 0.3%1 – see notes for further details]. This uses the ‘haversine’ formula to calculate the great-circle distance between two points – that is, the shortest distance over the earth’s surface – giving an ‘as-the-crow-flies’ distance between the points (ignoring any hills they fly over, of course!). note that angles need to be in radians to pass to trig functions! 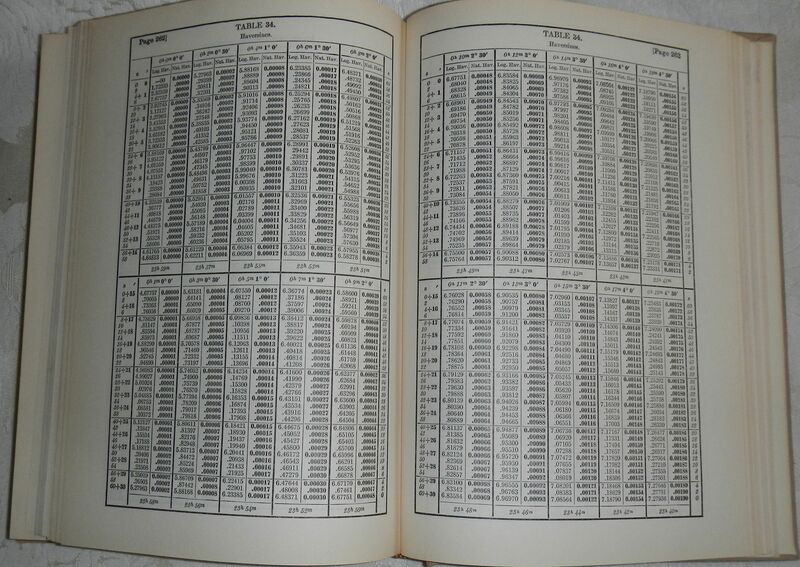 Historical aside: The height of tech­nology for navigator’s calculations used to be log tables. As there is no (real) log of a negative number, the ‘versine’ enabled them to keep trig func­tions in positive numbers. Also, the sin²(θ/2) form of the haversine avoided addition (which en­tailed an anti-log lookup, the addi­tion, and a log lookup). Printed tables for the haver­sine/in­verse-haver­sine (and its log­arithm, to aid multip­lica­tions) saved navi­gators from squaring sines, com­puting square roots, etc – arduous and error-prone activ­ities. The haversine formula1 ‘remains particularly well-conditioned for numerical computa­tion even at small distances’ – unlike calcula­tions based on the spherical law of cosines. The ‘(re)versed sine’ is 1−cosθ, and the ‘half-versed-sine’ is (1−cosθ)/2 or sin²(θ/2) as used above. Once widely used by navigators, it was described by Roger Sinnott in Sky & Telescope magazine in 1984 (“Virtues of the Haversine”): Sinnott explained that the angular separa­tion between Mizar and Alcor in Ursa Major – 0°11′49.69″ – could be accurately calculated on a TRS-80 using the haversine. For the curious, c is the angular distance in radians, and a is the square of half the chord length between the points. If atan2 is not available, c could be calculated from 2 ⋅ asin( min(1, √a) ) (including protec­tion against rounding errors). Using Chrome on a middling Core i5 PC, a distance calcula­tion takes around 2 – 5 micro­seconds (hence around 200,000 – 500,000 per second). Little to no benefit is obtained by factoring out common terms; probably the JIT compiler optimises them out. This makes the simpler law of cosines a reasonable 1-line alternative to the haversine formula for many geodesy purposes (if not for astronomy). The choice may be driven by programming language, processor, coding context, available trig func­tions (in different languages), etc – and, for very small distances an equirectangular approxima­tion may be more suitable. While simpler, the law of cosines is slightly slower than the haversine, in my tests. This uses just one trig and one sqrt function – as against half-a-dozen trig func­tions for cos law, and 7 trigs + 2 sqrts for haversine. Accuracy is somewhat complex: along meridians there are no errors, otherwise they depend on distance, bearing, and latitude, but are small enough for many purposes* (and often trivial compared with the spherical approxima­tion itself). Alternatively, the polar coordinate flat-earth formula can be used: using the co-latitudes θ1 = π/2−φ1 and θ2 = π/2−φ2, then d = R ⋅ √θ1² + θ2² − 2 ⋅ θ1 ⋅ θ2 ⋅ cos Δλ. I’ve not compared accuracy. In general, your current heading will vary as you follow a great circle path (orthodrome); the final heading will differ from the initial heading by varying degrees according to distance and latitude (if you were to go from say 35°N,45°E (≈ Baghdad) to 35°N,135°E (≈ Osaka), you would start on a heading of 60° and end up on a heading of 120°!). Since atan2 returns values in the range -π ... +π (that is, -180° ... +180°), to normalise the result to a compass bearing (in the range 0° ... 360°, with −ve values transformed into the range 180° ... 360°), convert to degrees and then use (θ+360) % 360, where % is (floating point) modulo. For final bearing, simply take the initial bearing from the end point to the start point and reverse it (using θ = (θ+180) % 360). Just as the initial bearing may vary from the final bearing, the midpoint may not be located half-way between latitudes/longitudes; the midpoint between 35°N,45°E and 35°N,135°E is around 45°N,90°E. where f is fraction along great circle route (f=0 is point 1, f=1 is point 2), δ is the angular distance d/R between the two points. Given a start point, initial bearing, and distance, this will calculate the destina­tion point and final bearing travelling along a (shortest distance) great circle arc. For final bearing, simply take the initial bearing from the end point to the start point and reverse it with (brng+180)%360. This is a lot simpler using vectors rather than spherical trigonometry: see latlong-vectors.html. Here’s a new one: I’ve sometimes been asked about distance of a point from a great-circle path (sometimes called cross track error). Here, the great-circle path is identified by a start point and an end point – depending on what initial data you’re working from, you can use the formulas above to obtain the relevant distance and bearings. The sign of dxt tells you which side of the path the third point is on. Sailors used to (and sometimes still) navigate along rhumb lines since it is easier to follow a constant compass bearing than to be continually adjusting the bearing, as is needed to follow a great circle. Rhumb lines are straight lines on a Mercator Projec­tion map (also helpful for naviga­tion). Rhumb lines are generally longer than great-circle (orthodrome) routes. For instance, London to New York is 4% longer along a rhumb line than along a great circle – important for avia­tion fuel, but not particularly to sailing vessels. New York to Beijing – close to the most extreme example possible (though not sailable!) – is 30% longer along a rhumb line. Key to calculations of rhumb lines is the inverse Gudermannian func­tion¹, which gives the height on a Mercator projec­tion map of a given latitude: ln(tanφ + secφ) or ln( tan(π/4+φ/2) ). This of course tends to infinity at the poles (in keeping with the Mercator projec­tion). For obsessives, there is even an ellipsoidal version, the ‘isometric latitude’: ψ = ln( tan(π/4+φ/2) / [ (1−e⋅sinφ) / (1+e⋅sinφ) ]e/2), or its better-conditioned equivalent ψ = atanh(sinφ) − e⋅atanh(e⋅sinφ). Since a rhumb line is a straight line on a Mercator projec­tion, the distance between two points along a rhumb line is the length of that line (by Pythagoras); but the distor­tion of the projec­tion needs to be compensated for. 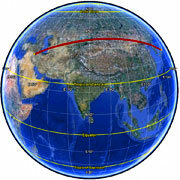 A rhumb line is a straight line on a Mercator projection, with an angle on the projec­tion equal to the compass bearing. Given a start point and a distance d along constant bearing θ, this will calculate the destina­tion point. If you maintain a constant bearing along a rhumb line, you will gradually spiral in towards one of the poles. This formula for calculating the ‘loxodromic midpoint’, the point half-way along a rhumb line between two points, is due to Robert Hill and Clive Tooth1 (thx Axel!). Trig functions take arguments in radians, so latitude, longitude, and bearings in degrees (either decimal or degrees/minutes/seconds) need to be converted to radians, rad = π.deg/180. When converting radians back to degrees (deg = 180.rad/π), West is negative if using signed decimal degrees. For bearings, values in the range -π to +π [-180° to +180°] need to be converted to 0 to +2π [0°–360°]; this can be done by (brng+2.π)%2.π [or brng+360)%360] where % is the (floating point) modulo operator (note that different languages implement the modulo operation in different ways). All bearings are with respect to true north, 0°=N, 90°=E, etc; if you are working from a compass, magnetic north varies from true north in a complex way around the earth, and the difference has to be compensated for by variances indicated on local maps. The atan2() function widely used here takes two arguments, atan2(y, x), and computes the arc tangent of the ratio y/x. It is more flexible than atan(y/x), since it handles x=0, and it also returns values in all 4 quadrants -π to +π (the atan function returns values in the range -π/2 to +π/2). If you are using Google Maps, several of these functions are now provided in the Google Maps API V3 ‘spherical’ library (computeDistanceBetween(), computeHeading(), computeOffset(), interpolate(), etc; note they use a default Earth radius of 6,378,137 meters). If you use UK Ordnance Survey Grid References, I have implemented a script for converting between Lat/Long & OS Grid References. If you use UTM coordinates or MGRS grid references, I have implemented scripts for converting between Lat/Long, UTM, & MGRS. I learned a lot from the US Census Bureau GIS FAQ which is no longer available, so I’ve made a copy. Thanks to Ed Williams’ Aviation Formulary for many of the formulas. Note I use Greek letters in variables representing maths symbols conventionally presented as Greek letters: I value the great benefit in legibility over the minor inconvenience in typing (if you encounter any problems, ensure your <head> includes <meta charset="utf-8">), and use UTF-8 encoding when saving files). I also have a page illustrating the use of the spherical law of cosines for selecting points from a database within a specified bounding circle – the example is based on MySQL+PDO, but should be extensible to other DBMS platforms. Several people have asked about example Excel spreadsheets, so I have implemented the distance & bearing and the destination point formulas as spreadsheets, in a form which breaks down the all stages involved to illustrate the operation. February 2019: I have refactored the library to use ES modules, as well as extending it in scope; see the GitHub README and CHANGELOG for details. Performance: as noted above, the haversine distance calculation takes around 2 – 5 micro­seconds (hence around 200,000 – 500,000 per second). I have yet to complete timing tests on other calculations. Other languages: I cannot support translations into other languages, but if you have ported the code to another language, I am happy to provide links here. Brian Lambert has made an Objective-C version. Jean Brouwers has made a Python version. Vahan Aghajanyan has made a C++ version.